Description: An EB waits for a crew. 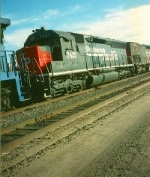 Title: Southern Pacific SD45R No.7437 Provo,Utah November 6,1993. Description: Southern Pacific SD45R No.7437 in brand new SP Speed Lettering shines in late autumn sunlight at Provo. Description: Both surprisingly clean (for SP power), SP 7437 and SP 8521 lead NS 391 through Memphis as they round the "S" curve a mile east of NS's Forest Yard on April 8, 2001. Description: Who could go wrong with seeing ''Old School'' Motive Power on a train these days? Here,Rio Grande 5388 leads an eastbound manifest at Provo's Backmans Crossing. Description: Southern Pacific SD45R No.7437 all rebuilt,repainted,and relettered in ''Rio Grande Style'' speed lettering is seen behind two other speed lettered locomotives with a shiny red snoot. Description: Southern Pacific SD45R in new paint and the Rio Grande Inspired ''Speed Lettering''.